Vintage Influence: Calm Down..... Its Only A Table !!!! 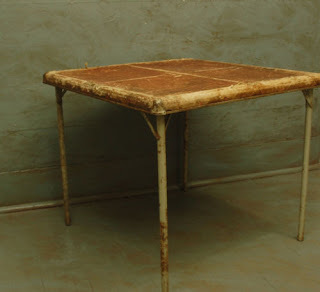 Calm Down..... Its Only A Table !!!! 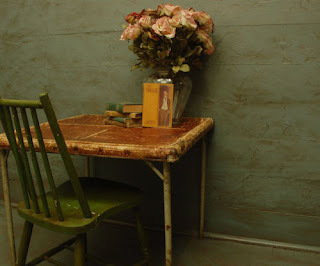 Every so often in my vintage, shabby, industrial, adventures I will find something that 'finds me''. I instantly know that I will keep it, just that little bit longer than I should. It is invariably nothing grand. Its usually something I wasn't looking for. It isn't on my wish list and I find it where I least expect to. But it nearly always ellicits the cry from the Big Man of "calm down its only a ..........", Good luck with filling in the blanks beacuse with my funky, eclectic tastes it really can be ANYTHING. This time it was a table. OK, I hear you say, whatever it is she's drinking I'll have a pint of it !!!!! But just look at this. This gorgeous find is a shabby, industrial, table that was a fold away card table back in the day. 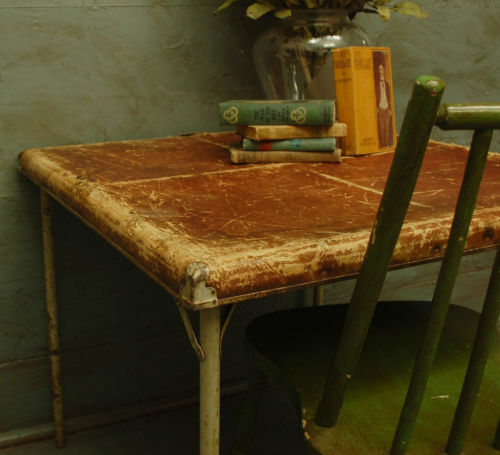 It has all the elements that I look for in my treasures; character, patina, quirkiness, WOW and I LOVE IT - what vintage is all about !!!!. 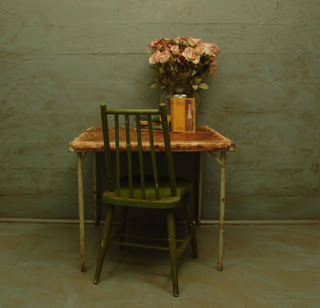 Look at the shabby, chippy paint on those legs, the colour of which, through just the right amount of rust, is a faded shade of the palest green. (Trust me Farrow and Ball would die to include this in their English Heritage Paint range). 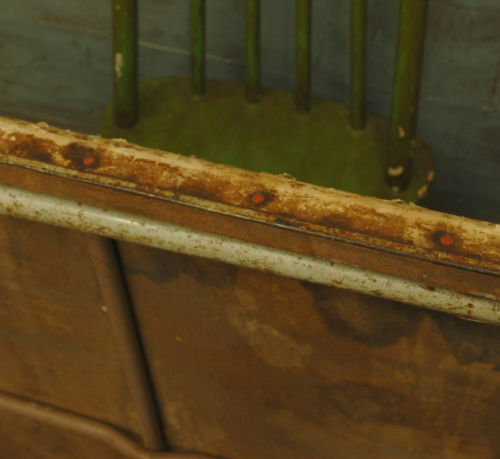 Check out the top, a thick, weathered cardboard which was given the appearance of leather hide and which now has the most amazing patina which only comes with age and use (A bit like all of us !!!!) - just beautiful (A bit like all of us !!!!). 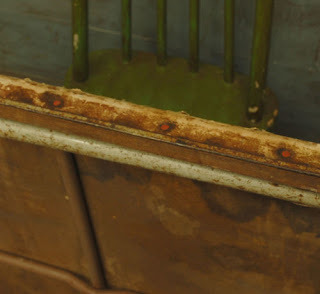 Even the shabby, red rivets around the edge add character and a splash of colour - delightful. So now you may be thinking what ever she's having.... I'll have TWO pints - But this is why I do what I do. When you find IT , trust me, you just know and for now its home is with me and its story continues. I love it. Love my new chair too!!!!! Had such fun today..Thanks so much, once again!!!!! I bet it could tell a few interesting stories too.........!! So What Do You Do Again ?!?!?!? How Do I Comment !!!!!!!!! There was life before Cath Kidston !!!! !